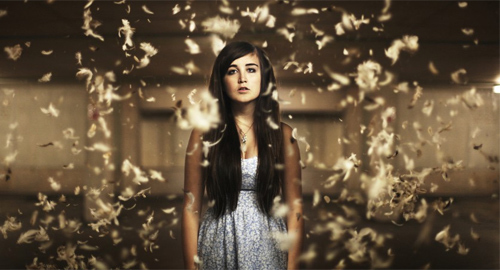 I first wrote about Lauren Aquilina in 2013, shortly before her pet budgie tragically exploded. Back then, she was a brand new artist heading off to SXSW to mingle with the masses and shake hands with oily men from the music "industry". She's taken her time since then, developing her sound over a series of EPs and signing to Island Records; while being talent spotted by Taylor Swift, who picked her as an opening act for her Hyde Park show last year. “@laurenaquilina: this week has been nothing but a slow, painful wait for the @taylorswift13 album” AHH! So sweet! PS I love the Fools EP. Playing the long game has paid dividends for the Bristol-born singer... Her new material is (in her own words) dreamy, cinematic, honest and (in my words) beguiling, clever and subtle. Her new song, Echoes, is slated to be the first single from her debut album. Have a listen below. You won't be disappointed. Unless you were expecting it to sound like Megadeath.